Team Van Oord (TVO) has been named the preferred bidder on Abbey Mill Sluice, the first project it has secured in the Environment Agency Midlands area. 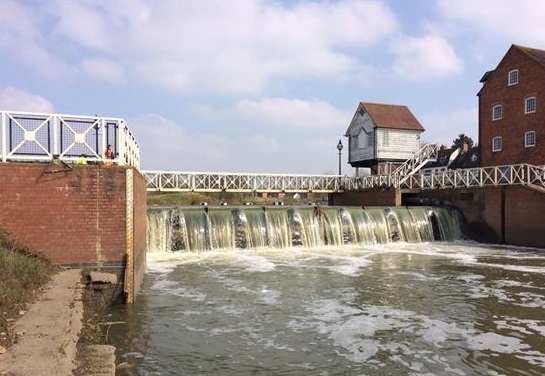 The picturesque and historic Abbey Mill Sluice is a fish belly gate on the River Avon through Tewkesbury, which controls water levels for both navigation and flood risk management. There has been a mill on this site since around 1190, and in monastic times it was the principal mill for Tewkesbury Abbey. The mill was rebuilt in 1793 and then enlarged in the mid nineteenth century, but subsequently declined and eventually ceased operation as a mill in 1921, when it became a restaurant. In 2005, it was converted into a private residence. The current sluice gate was installed in the mid 1990s and is now exceeding its major operational inspection. As such, the Environment Agency determined that the gate requires refurbishment. TVO’s approach, as outlined in its successful bid for the project, includes designing and installing stop logs to de-water the area, and removing the existing gate in order to minimise disruption to local residential properties. The only access to site is across a Site of Special Scientific Interest (SSSI) which will be protected by a recycled plastic track way to minimise damage to the area. All associated MEICA (mechanical and electrical) replacement and refurbishment will be undertaken by TVO’s in-house MEICA team. These works will include replacing the hinges, hydraulic rams and cabling, along with the associated MEICA controls for the operation of the gate including the PLC (Programmable Logic Controller) and the control philosophy for the gate’s operation. Phil Ramsay, Team Van Oord’s National Framework Manager for the Environment Agency, said: “We are naturally delighted to have picked up our first Environment Agency project in the Midlands area.